Looking for a way to import transactions that isn’t Direct Import? Live outside the U.S. or Canada? File-based Importing is here, and it is just for you. Click the Import button in any account that does not have Direct Import enabled. Or, drag and drop your file or files onto YNAB. Anywhere onto YNAB – like magic! Once you’ve done this, you’re just steps away. You’ve now got a few options and settings to make sure your transactions are coming in just the way you want them. Select the account you want the transactions imported into. If your file includes transactions dated before your account start date, you’ll see an option to include or exclude those. 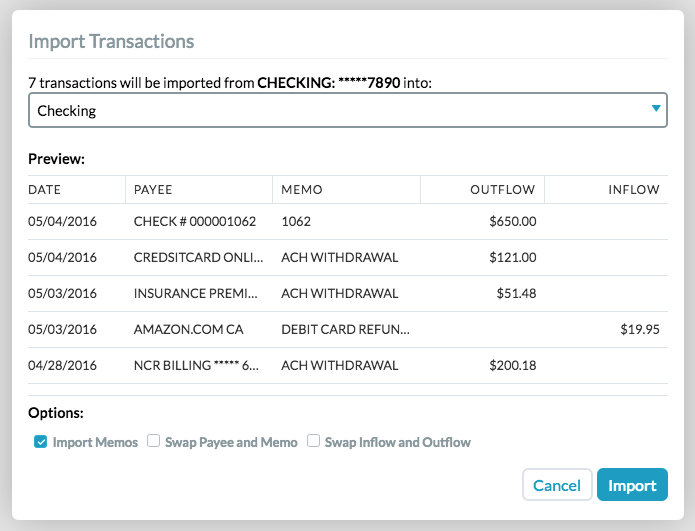 If your bank tends to put the payee in the memo field, check the Swap with Payees box to reverse those fields. If you’re importing multiple files at once, you will be shown this set of options for each file. For each, adjust your settings, and choose to either Skip that file, or save the settings for that file and move onto the next.